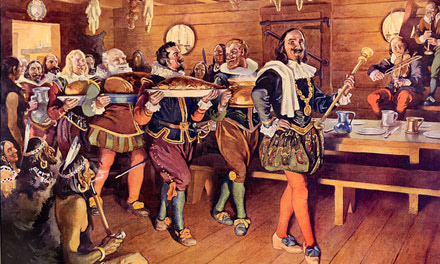 During the summer of 1606, part of the company of Port Royal settlers, under their leader, Poutrincourt, explored the neighbouring coasts in their ship, while the remainder finished the building of the houses and cultivated the gardens of the colony. Those who stayed behind were under the command of Marc Lescarbot, a witty lawyer from Paris with a taste for adventure and some literary skill, who later wrote an entertaining history of the colonizing experiment. Lescarbot conceived the idea of welcoming his exploring companions on their return with a dramatic performance. He wrote a play or dramatic spectacle, which he called "The Theatre of Neptune." Throughout the summer he conducted the rehearsals, and when Poutrincourt returned on the 14th of November, the amateur actors received him with this pageant, which was presented on the waters of the bay. In Lescarbot's book of verse, The Muses of New France, we may read the words and the scanty stage directions of this first play, written and performed within the limits of what is now the Dominion of Canada. Neptune, god of the sea, welcomes the French to his domain and predicts the future greatness of France in the new world. He is attended by six Tritons, who draw his chariot, and by four Indians, who bring tribute of the natural products of the country, and pay homage to the king of France. All make speeches, to which Poutrincourt replies, and the spectacle comes to an end with an invitation to land and partake of the feast which has been prepared for them. 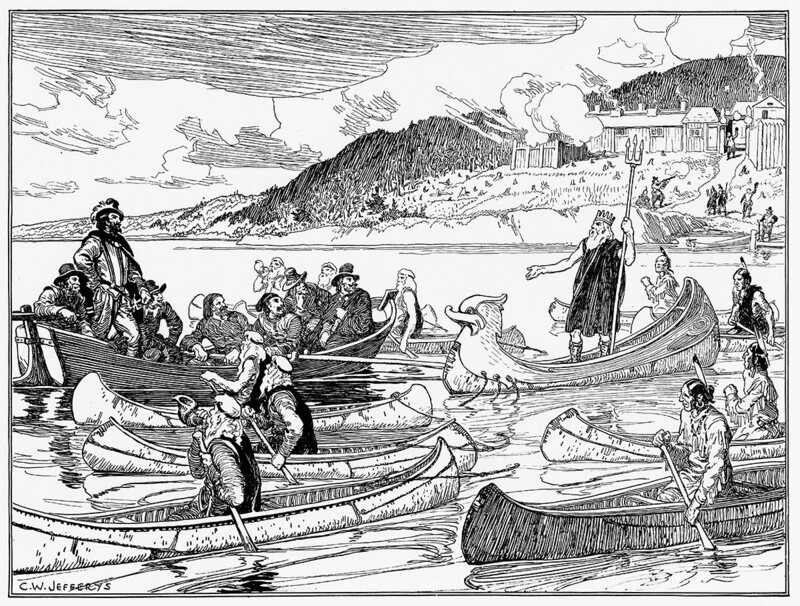 For the details of this picture, there is very little information available, either in the play itself, or in the histories of the colony written by Lescarbot and Champlain. We must rely therefore upon the imagination and the probabilities of the situation to supplement the scanty data of the written record. Neptune, according to Lescarbot's directions, is dressed in a blue robe, with buskins on his feet, wears a long beard and grey hair, and carries his trident in his hand. His chariot was probably a boat or canoe, decorated with a dolphin's head, and painted in bright colours, and doubtless was drawn by the attendant Tritons seated in canoes to take the places of the sea-god's horses. Lescarbot's knowledge of the classics would lead him to make some attempt at dressing the Tritons in appropriate head-gear and robes, and furnishing them with sea-shells to represent the conches on which they are figured as blowing in antique sculptures. The Indian parts most likely were taken by Frenchmen of the company, disguised and costumed as natives. Lescarbot, wearing a short cloak, the doublet and French knee breeches of the period, is depicted, with some of his company, on board the shallop in which they came ashore from their ship anchored farther out in the Basin and not shown in the picture. In the background is seen the settlement and the smoke from the cannon firing a salute to the returning commander, floating against the dark wooded hillside. 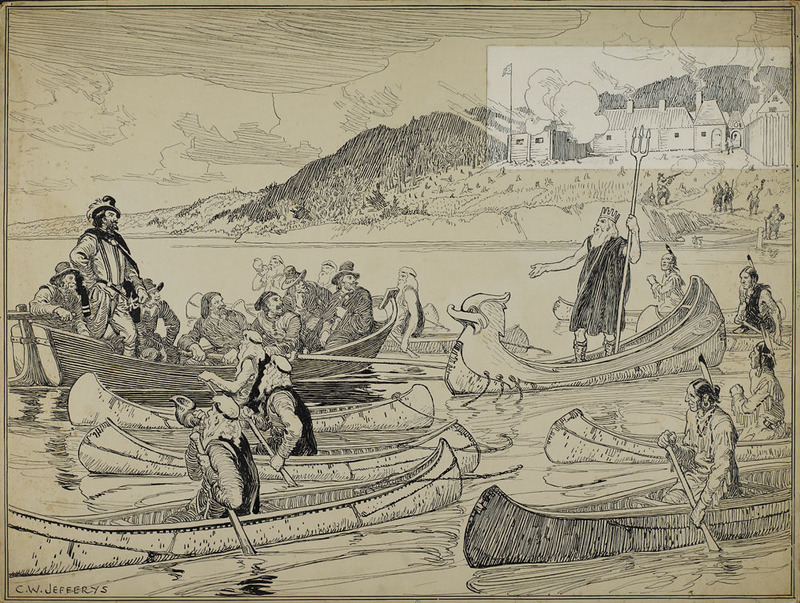 This pageant was presented on the waters of the Annapolis Basin at Port Royal. 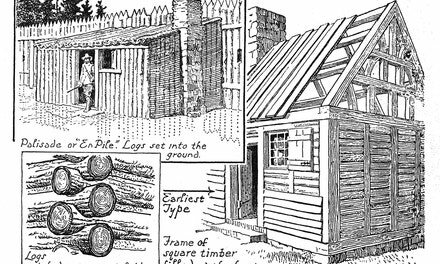 It was written by Marc Lescarbot, a member of the company, the author of an entertaining history of the colonizing experiment. This play, entitled The Theatre of Neptune, was performed on the 14th of November, 1606, to welcome the return of Poutrincourt, the governor, from a voyage of exploration. Two English translations have been made within recent years: one by Mrs. Harriette Taber Richardson, published by Houghton Mifflin Company, Boston, Mass., and one by Professor R. K. Hicks, of Trinity College, Toronto, published in the Queen's Quarterly, Kingston.